Posole is dried field corn (hominy) that is treated with mineral lime to soften and remove the skins, and improve the flavor. It also refers to the stew based on posole. 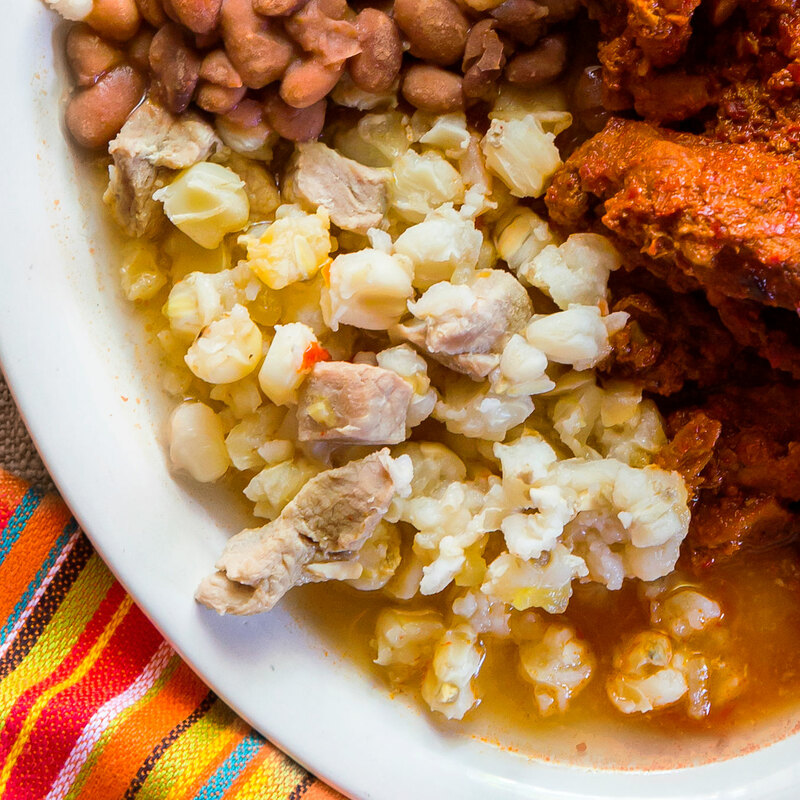 At Rancho de Chimayó restaurant in New Mexico, it's served as an earthy, fragrant side dish for carne adovada (braised red-chile pork). If using dried prepared posole, rinse well, then put in a bowl and soak in water to cover by 2 in. Let soak at least 4 hours and up to Drain. Put prepared posole in a large heavy saucepan or stockpot and cover with 8 cups water. Bring to a boil, covered; then reduce heat to medium-low and simmer, uncovered, 2 hours. Add remaining ingredients and cook 1 1/2 to 2 hours more, or until corn is puffed (almost like popcorn) and pork is fork-tender, stirring every now and then toward the end and adding enough hot water if necessary to keep posole covered. If using canned hominy, pour into pot, add remaining ingredients and 4 cups water, and bring to a boil, covered. Reduce heat to medium-low and simmer, uncovered, until pork is fork-tender, 1 to 1 1/2 hours, stirring every now and then toward the end and adding enough hot water if necessary to keep posole covered. Season with garlic salt to taste and serve with a slotted spoon. *Prepared posole refers to maize kernels that have been treated ("prepared") with culinary lime to remove their tough outer skins. Find it at ranchogordo.com. Find canned hominy and whole dried New Mexico chiles at well-stocked grocery stores and Latino markets.